Fabrications, fabric art by Gabriele DiTota, will open at Fifth Avenue Art Gallery on May 30. First Friday's opening reception on June 2, from 5:30 pm through 8:30 pm, will give you an opportunity to hear Gabriele's unique story. 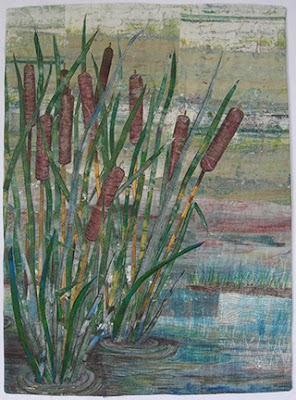 Come meet the artist and see her beautifully organic fabric art. DiTota was the winner of 100% Pure Florida at Fifth Avenue in 2016. Born in Northern Germany, where Gabriele's mother was a seamstress, she would play around the sewing machine trying to stay out of the way of the treadle. The family immigrated to America and a new way of life. Textiles and sewing didn’t return to Gabriele’s life in a meaningful way until she retired from the early education field. Since then Gabriele’s art quilts have been widely exhibited throughout the United States as well as overseas in England, Ireland and Australia. Both her Art Quilts and her Art Dolls have been published in books and in magazines. Matching seams and meticulous piecing were her first efforts in textile art fabrication, but they quickly gave way to a more organic, raw edge approach to quilting. Surface design techniques including monoprinting, mark making, dyeing, discharging and screen-printing help Gabriele create the unique fabrics she uses in her art works. Fabrications will open on May 30 and run through July 1. Fifth Avenue Art Gallery is in the Eau Gallie Arts District in Melbourne, FL. All events are open and free to the public.